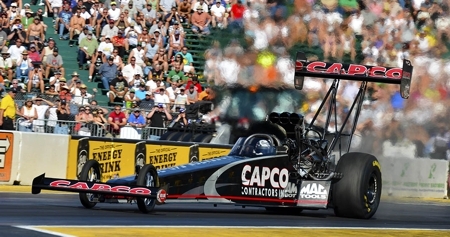 It wasn’t the enthusiasm of a first-year Top Fuel team owner that prompted Steve Torrence to say six months ago that he felt the Torrence Racing/Capco Contractors Inc. team was capable of finishing in the top five this year. He had confidence in crew chief Richard Hogan and his crew, and they have worked together to forge what has become not only a solid top-five entry, but one that now is a serious championship contender. Can a single-car Top Fuel team find happiness among a field of multi-car teams? It was a question Torrence asked -- and answered unequivocally – with strong performances during the ensuing 16 races that have carried him to fourth place in Full Throttle Series standings. He won his first Top Fuel title at Atlanta in May and added victories at Englishtown, N.J. and Seattle to go along with two runners-up. The five final rounds so far this year put him in elite company with seven-time champion Tony Schumacher (5 finals). Only Antron Brown (8) and Spencer Massey (6) have more. Those results set the stage for what Torrence hopes to will be a stellar performance in this weekend’s 58th running of NHRA’s revered Mac Tools U.S. Nationals – the sports oldest race – Friday through Monday at Lucas Oil Raceway. It is the final event before the Countdown to One begins and it sets the 10-driver lineups for NHRA’s exciting six-race drive to the championship, which Torrence hopes to begin in the top three. “I am really pleased with the progress we’ve made in a short time,” Torrence said of his Brownsburg, Ind.-based team. “Everyone has been working hard. I didn’t expect us to be contenders this soon. Torrence also has an opportunity to pick up an additional $100,000 on Saturday in the Traxxas Top Fuel Nitro Shootout – a new eight-driver battle that carries that big winner’s check. The runner-up receives $15,000 and the semifinal losers earn $7,500. Torrence used last week’s pre-Indy test session to make some 1,000-foot laps and Hogan was able to use the data to make some tuning adjustments. “The car ran well and Richard was pleased with the results,” he commented.